This kit is new, comes with all the pieces pictured. 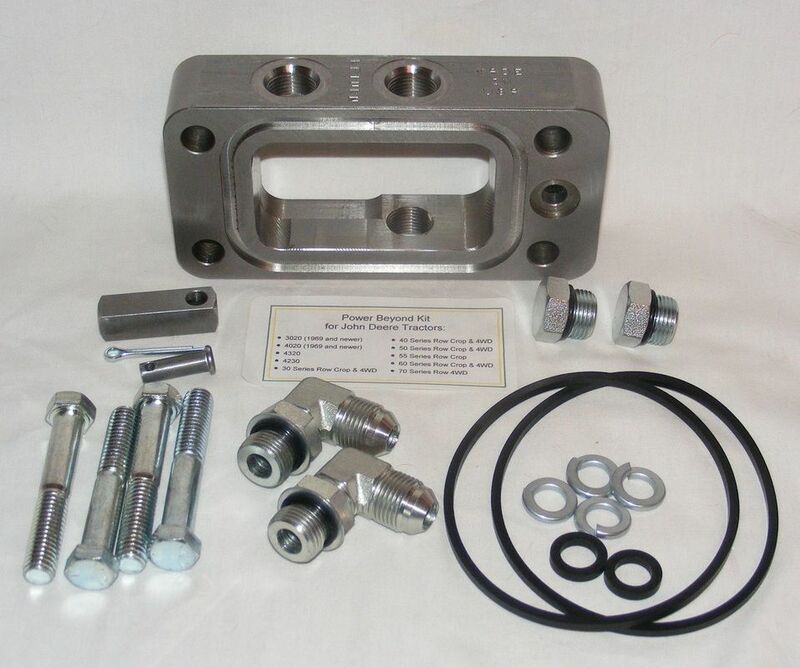 With this kit you can run additional hydraulic valves for attachments such as a log splitter, forks, etc. The Power Beyond housing is not a casting like you would get from John Deere. Our housing is made of 1018 steel and was machined on a CNC mill to the same specifications as the housing from John Deere. Also, List of known tractors that the kit will work on: 3020 (1969 and newer); 4020 (1969 and newer); 4320; 4230; 30 Series Row Crop and 4WD 4030,4230,4430,4630; 40 Series Row Crop and 4WD 4040,4240,4440,4640,4840;50 Series Row Crop and 4WD 4050,4250,4450,4650,4850; 55 Series Row Crop; 60 Series Row Crop and 4WD; 70 Series Row 4WD. If your tractor is not listed above, contact us before you buy to insure the Power Beyond Kit will work for your model of John Deere tractor. Our front tractor weight bolts are machined to John Deere specifications stud bolts or screws that fit on the front of various John Deere tractors for attaching weights to.They are the same size and specs as JD part no. R27645. They will come to you as seen with no finish or protective coating on them. John Deere tractors that the Front End Weight Stud Bolts will fit: 2510, 2520, 3010, 3020, 4010, 4020, 4320, 4520, 4620 and possibly others. You will receive 2 bolts (a pair). This specialty tool is used to center the steering meter pump. Our tool is made from the same measurements as the John Deere tool, JDH-42-2. Our tool is made from drill rod and machined in our shop. You will receive 2 pins and they will come to you as shown with no finish or protective coating. The clutch alignment tool or pilot tool works on 6 different tractors, the smaller end can be used on the 3000 series tractors and the larger end works on the 4000 series tractors.This one tool takes the places of two separate tools. This tool works on the following tractors: 3010, 3020, 4000, 4010, 4020, and 4320.This tool was made from a solid pieces of 1¾” diameter 1018 cold rolled steel. It was machined on a CNC lathe according to the specifications found in “I&T Shop Service manual no. JD-49 (also the same drawing found in manual no. JD-53 and JD-203). After being machined it was given a black finish. Unlike similar tools made of plastic, our tool will last for years to come. Our clutch adjusting tool was made from an 1/8th thick piece of 1018 steel that was machined on a CNC mill. It was made to the same specifications as the John Deere tool, JDE-61. For use on the following JD tractors: 3010, 3020, 4000, 4010, 4020, 4320, 4520, 4620, and possibly others. price. Save on shipping cost when you purchase the set. This tool is used for assisting in the installation of rockshaft valves. Our tool was made from the same specifications as the original JDH-28 (pictured far left). You will be receiving the silver tool to the right. This clutch adjusting tool was made from a piece of 1018 steel that was machined on a CNC mill. It was made to the same specifications as the John Deere tool, JD-227. This one tool can be used on 6 different tractors for adjusting the steering valve. A must have for any tractor mechanic that works on John Deere series tractors listed below (and possibly other models): 3020, 4000, 4020, 4320, 4520, and 4620. This tool was made from solid piece of 1018 Cold Rolled Steel. It comes with two bolts and locking jam nuts as seen in the photos. It was machined on a CNC mill from the same specifications from an original tool, JDH-3D (replaces JDH-3C). For use on 3000 and 4000 Series John Deere tractors. 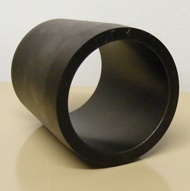 For use on John Deere tractors, 3000 Series, 4000 Series and some 5000 Series. This tool was made from 1018 steel and machined on a CNC mill using the same specifications from an original OTC here at our shop. The JDH-8 tool is used as a stop when using the JDH-11 rockshaft valve indicator (not included). 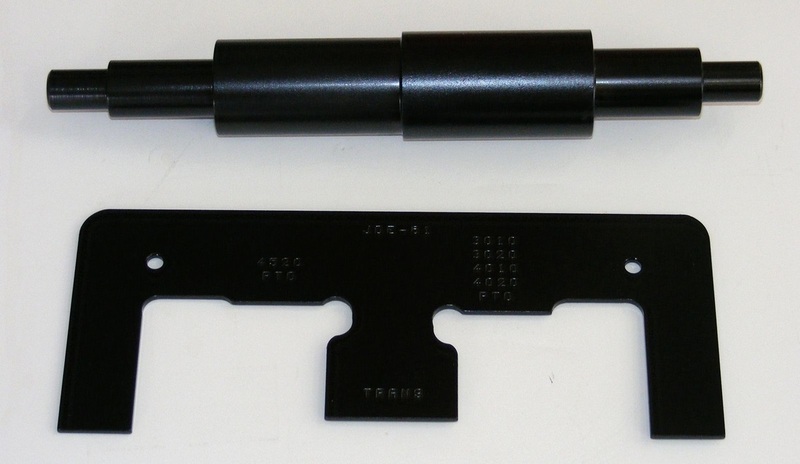 This specialty tool is used to load springs and balls into low and high range synchronized blockers on transmission drive shafts of John Deere tractors.Our tool is made from the same specifications as the John Deere tool, JDT-4.It was made from a piece of 1018 steel and turned on a CNC lathe.After being machined it was given a black finish to prevent rusting. It is known to work on John Deere 3010, 3020, 4010, and 4020. It could possibly be used on other 3000 series and 4000 series tractors. For use on John Deere 3020 and 4020 tractors, 1969 and newer. This tool was made from 1018 steel and machined on a CNC mill using the same specifications from an original OTC tool here at our shop. The JDH-15 tool is used as an adjusting plate for the selective control valve. The plate comes as shown with the 5 bolts pictured. For use on John Deere 30 series tractors. This tool was made from 1018 steel and machined on a CNC mill using the same specifications from an original OTC tool here at our shop. 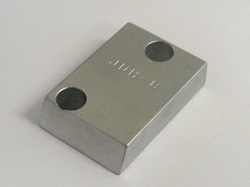 The JDH-15C tool is used as an adjusting plate for the selective control valve. The plate comes as shown with the 6 bolts pictured. 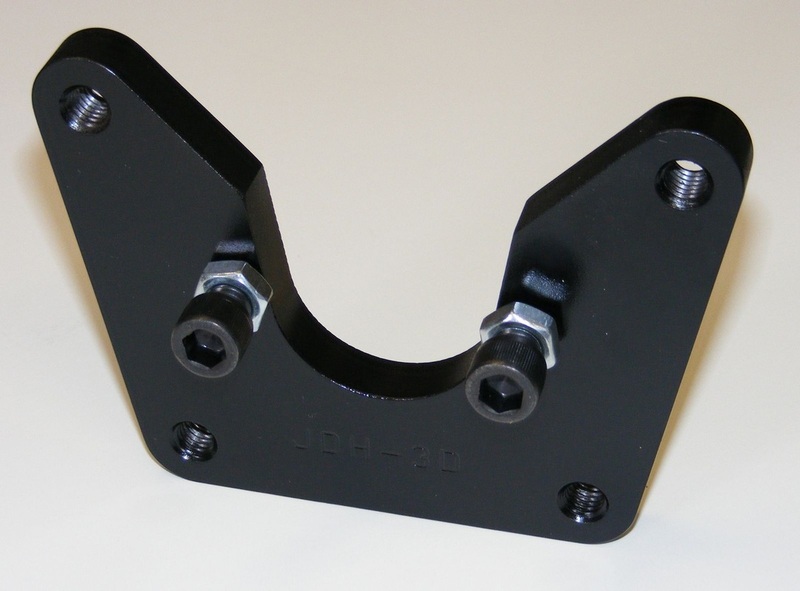 This specialty tool is used to replace camshaft bearings on certain John Deere tractors. Our tool is made from the same specifications as the John Deere tool, JDE-6 and is a 7 piece set that includes: (1) JDE-6-1 rod, (1) JDE-6-3, (2) JDE-6-4, (1) JDE-6-5, and (2) JDE-6-6. All the pieces were made from 1018 steel and turned on a CNC lathe. After being machined they were painted black to prevent rusting. It is known to work on John Deere 3010, 3020, 4010, and 4020. It could possibly be used on other 3000 series and 4000 series tractors. 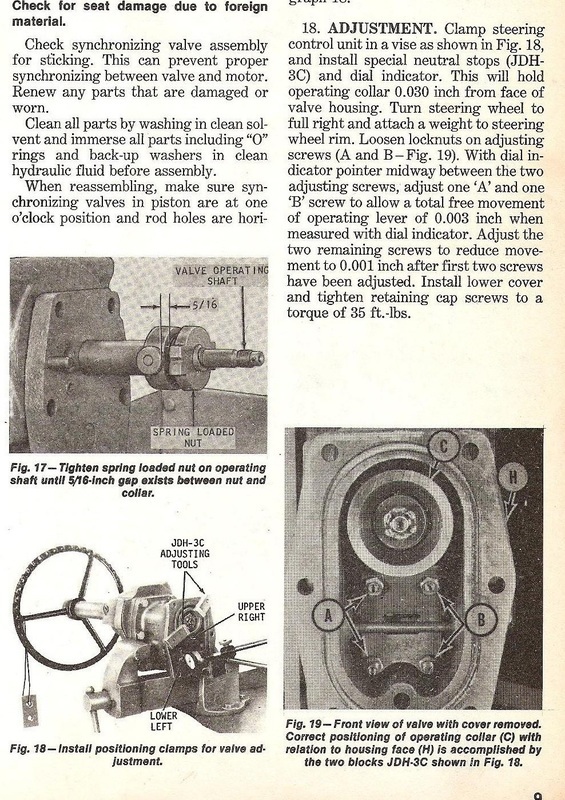 Below is a scan from a JD 4000 Series Service Manual (©1963), showing the tool in use.